Think opening the books on public business doesn’t bother corporations? Think again. While transparency is good, and will result from a new law passed last year, lawmakers made a mistake in not having the new legislation take effect immediately. Lawmakers ordered annual public disclosure of recipients of the Research Activities Credit with claims exceeding $500,000. Instead of an immediate effective date, the law carried a July 1 effective date. That gave companies two months to get their claims filed before the information gathering would begin — a temporary window to avoid disclosure. Some jumped through that loophole, to the tune of an estimated $25 million. The Iowa Department of Revenue reported on this in its December Contingent Liabilities report for the Revenue Estimating Conference. After estimating RAC claims for FY2009 at $45.5 million and $46.1 million in August and October reports, that number spiked to $70.8 million in the December report. 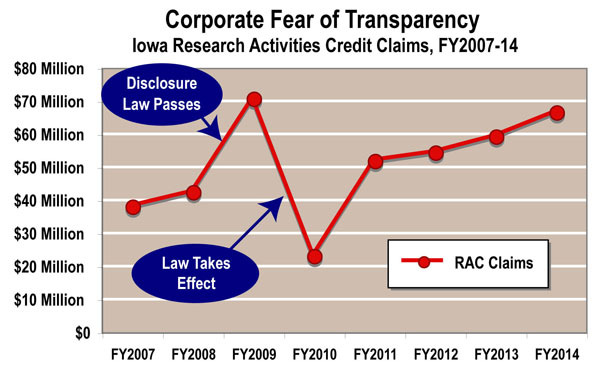 The graph above shows where the steady upward trend in RAC claims broke sharply with passage of the disclosure law, claims spiking just ahead of the law taking effect, and the projected one-year reduction before the trend returns. Think opening the books on public business doesn’t bother corporations? Think again. When public business is tied too closely to private business, as we see with the RAC, taxpayer accountability suffers.